In part twelve of Knightfall Batman has had his back broken by Bane. 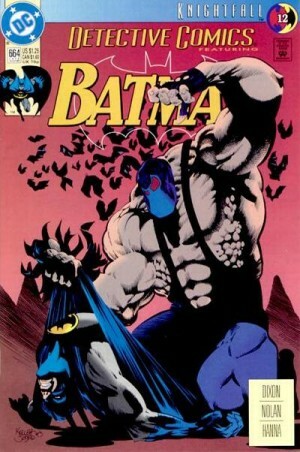 Bane takes Batman to one of the highest buildings in Gotham. Banes tells the people of Gotham that the Dark Knight is no more and that he is a broken man. Batman is then tossed from the building landing on the sidewalk. People gather to see the fallen hero. Soon the Gotham City Police Department show up and keeps the crowd back. An EMT shows up and takes Batman away. Detective Montoya is a little weary of all this but she is given the word of the EMT that the Batman will be well taken care of. Commissioner Gordon becomes upset when he finds out that Batman never made it to any of Gotham's hospitals. Joker and Scarecrow are upset with the fact that Batman ruined their plans with the mayor. Scarecrow gets so upset that he uses his fear gas on The Joker. The gas has no effect on The Joker due to the fact that he is insane. In a blind rage Joker beats Scarecrow in a bloody pulp. Much like he did to the second Robin, Jason Todd. The EMT workers who have taken Batman away turns out to be on other than Robin and Alfred. They rush Batman back to the batcave and hook him up to emergency life support. The do an x-ray that reveals that Batman has a broken back. Which makes matters worst his spine is swelling to a point where if they can't stop it he may never walk again. Alfred and Robin put in a call to Gordon at GCPD. Detective Bullock and Officer Montoya get the drug needed for Batman and take it to a dead end. Azrael and Robin show up and take the drug back to the cave. Alfred gives it to Batman and the trio stands around and prays for a miracle.